Being the only theatre of our kind in the country to feature both touring concerts like REO Speedwagon, Scotty McCreery, and THIRD DAY, and Original Shows like The 2014 Christmas Show and Music of the Night (on stage now), we receive our fair share of press related to the wonderful events that we produce. That’s why the event that occurred on Friday, June 6, was such a unique thing that I just had to write about. 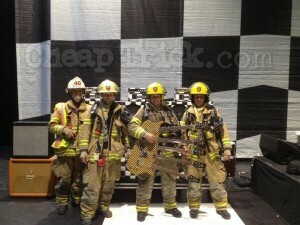 Cheap Trick was just finishing up a whirlwind show, where they rocked through tons of hits over the course of two hours when our Stage Manager witnessed a small a flame shooting out of one of our house sub-woofers. Being the quick thinker that he is, that flame didn’t stand a chance. He grabbed a fire extinguisher and put out the fire in seconds. Shortly thereafter, a fire alarm was pulled, and we had a safe evacuation of all of the evening’s patrons and employees from the theatre. The fire department showed up to inspect the situation, gave us the thumbs up, and that was that.